The flood of journalistic reports about people dying while trying to reach Europe that were published in the first weeks of October 2013 left little space to reflect on this problem within a broader, more complex framework. Following the nervous timing of the mass media, the news proliferated and vanished in a matter of days. This dynamic obscures the possibility of giving a closer look at the local developments that take place in those spots where the (wrongly) so-called “tragedy” hits hardest. A research stay in the Greek island of Lesbos conducted practically at the same time as the media onslaught offered me first hand contact with one of these stories. In a former summer camp for children, local activists created a self-organized, open door place where immigrants can live until they obtain the legal documents which allow them to continue their journey. Its name is Pikpa, and it was made possible through the donations and the volunteer work provided by the local population. Originally aimed at offering shelter to Greek citizens affected by the austerity measures that followed the financial crisis, when in 2012 the number of refugees and immigrants arriving to the island became critical, the organizers decided to extend the action to them. Like other eastern islands in the Aegean Sea, Lesbos lies much closer to Turkey than to the Greek mainland. Since in 2012 the Greek government finished the construction of a barbed wire fence separating the 12km-long land border with Turkey, the number of attempts to cross the border through this maritime route rapidly increased. Although here the distance to a non-EU country is much shorter than at Malta or Lampedusa, this part of the maritime European border has received relatively little media attention. 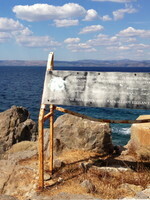 Like those islands, Lesbos – or Mytilini as the locals call it – is confronted with the direct consequences of the EU policies towards immigration, asylum and border management. A relatively small community must cope with the effects of political decisions that are made far away and whose consequences largely exceed the scale of their resources. The conflict of jurisdiction among local, national and European authorities had left a vacuum which was occupied by the active engagement of the civil society. Pikpa is the first experience of a totally open center for immigrants without papers and everyone I talked to assured me that it was unique along the Mediterranean. During my week in Mytilini, I saw middle class citizens bringing along clothes, shoes, and toys from their own children; a monk from a nearby monastery carrying lunch cooked by the nuns every day; activists offering orientation on how to continue the journey, calling lawyers, teaching basic Greek words; NGOs providing health care. I heard municipal authorities complain that the presence of the refugees in Pikpa is a threat to the neighborhood because of the risk of criminality, the spread of disease, and loss of property value – and I heard locals claiming that this statement is not true, that the neighbors have nothing against it. And I saw Afghan, Syrian and Palestinian families living there in tense calm, waiting for their risky journey to continue, infinitely grateful to their local helpers. In Pikpa, a young Afghan man told me about his seven attempts to cross the border to Europe from Turkey, by land and sea. He said that he had left his country threatened by the Taliban after having worked for NATO. He told me that Greek policemen had beaten him badly while trying to cross by land; that members of the Greek Coast Guard aimed weapons at him and his fellow travelers and broke the motor of their boat when trying to cross by sea. A member of the municipal council told me that they hear stories of immigrants being mistreated on board Greek patrol boats but that people are too terrified to deplore it (a recent Amnesty International report published similar testimonies). I heard concerns that persons filling the profile of normal immigrants are being increasingly accused of trafficking and in danger of facing life-long sentences with little chance of getting legal advice. I met an Afghan woman with her four children waiting desperately for news from her husband who had been incarcerated under such an accusation. During this same week spent in Lesbos, I also witnessed the opening of a new “First Reception Center” by the Greek authorities and the transportation of the inhabitants of Pikpa to this place. Located on military ground and impossible to reach by public transportation, the people sent there will be isolated from the local population and forced to live in a very limited space. The volunteers at Pikpa call it “the jail” and it actually resembles one: a row of containers surrounded by high barbed wire, elevated surveillance towers and reflectors patrolled by security forces. They say that the authorities want to expand it in order to host up to 700 people for up to 18 months, while similar centers are constructed throughout Greece as the main, official response to the European migration, refugee and border crisis. Before leaving Mytilini I saw the local activists discuss and protest, determined not to give up their solidarity with the immigrants. The past experiences on the island allow me to believe that they won’t: Here, engaged citizens managed to shut down the infamous detention center of Pagani in 2009, where refugees lived in overcrowded, extreme conditions. They had set up tents for the refugees living in public parks. They themselves had dug graves to respectfully and properly bury the anonymous bodies washed ashore. They had taken from the port people detained for weeks out in the open, exposed to the scorching summer sun and offered them the shade of the Pikpa pines. Here, volunteers know many immigrants by their names and after they leave sometimes stay in contact. They know how many arrive on the island each week. It is difficult to grasp intellectually the social and cultural meaning of the EU borders under the pressure of an urgent humanitarian crisis which is also a highly contested political matter. It is equally difficult to try to regard scientifically the larger picture and the longer term when one’s own object of study is being targeted by the frantic but ephemeral agenda of the media. In the Ph.D. Program “Europe in the Globalized World,” started at the Center of Excellence at the University of Konstanz in April 2013, we aim to make sense of the role and self-understanding of Europe in a broader framework. We assume that Europe cannot be understood isolated from the complex interdependencies that tie it to the rest of the world and want to contribute to a deeper knowledge of how those entanglements arise, work and what effects they create. In order to achieve that, we need to consider the diachronic developments that shaped Europe along its globally entangled history, and to observe synchronically the manifold expressions of diversity and hybridity that increasingly shape it today. However, broadening the scope does not mean that the big questions cannot find answers in small deeds, or lie in the daily practices of social actors. Global challenges are also disputed locally and what Europe is or what it can become is not only decided at its political center, but negotiated at its distant borders, as the people in Mytilini are doing every day. Estela Schindel is scientific coordinator and a postdoc researcher at the Ph.D. Program “Europe in the Globalized World” conducting research into the social and cultural meaning of the EU border regime.